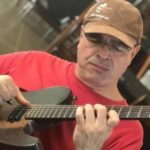 Tony DeCaprio presents a special Master Class in the art of mastering chord movement and the consequent relationships throughout substitution, reharmonization (also via basslines), displacement, constant structure patterns, and modal interchange. Points covered will include tritone substitution, extended dominant seventh chords (including the ubiquitous ii – V patterns) plus incorporating hybrid chords, changing chord quality, diminished chord studies, side-stepping, rhythm changes, and Coltrane substitutions. All this will be demonstrated for use in extended endings and modulatory interludes, intros and turnarounds. The 90 minute session will be fast paced, so sit back and take it all in, because Tony brings it all on like a human hurricane that knows the video version of the lesson will be available for study. In addition to combining much of the elements aforesaid, Tony will show how to transfer the chord theory (vertical) to the improvised line (horizontal), thus permitting the viewer/player to learn how to blow through such chord movement with a new awareness and to not simply fall prey to the often negative consequences of *only* chord/scale thinking. Tony will demonstrate the art of Droning; that is playing a chord, permitting it to sustain while simultaneously using the voice to sing certain tones. Jazz is an aural art, thus hearing and feeling tones against tones is the real deal as opposed to reading in a book about what is supposed to work and not work. Let’s get ready to rumble!! this was really an excellent class; full of good material you won’t find elsewhere. TD is at the top of the game.